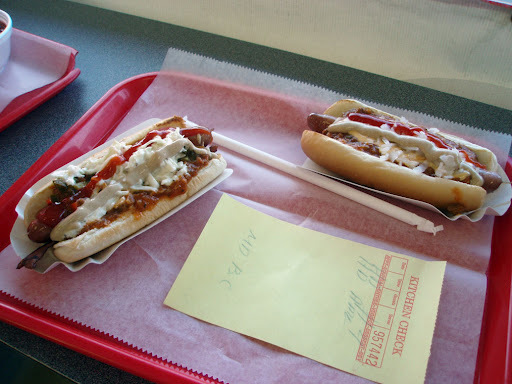 New Jersey may be the king of hot dogs fried in vats of oil (see Hiram’s and Rutt’s Hut for proof) but NYC has held sway with the mighty Crif Dog, who rule the toppings mountain. Now we have a contender for that category, in Dover. Milky and I just hiked around Lake Ramapo to see the ruins of Van Slyke Castle when a powerful hunger came over us on the drive home. 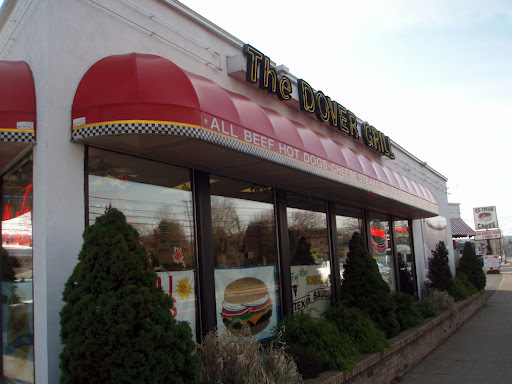 So we perused the Munchmobile Book from the Star-Ledger and found The Dover Grill. On the slow eastern side of Route 46, where its riddled with traffic lights, you’ll find this unassuming hut on a traffic triangle next to an ice cream parlor. Parking is around back across the street. At first glance it’s nothing special, but once you eye the menu, you’ll see otherwise. 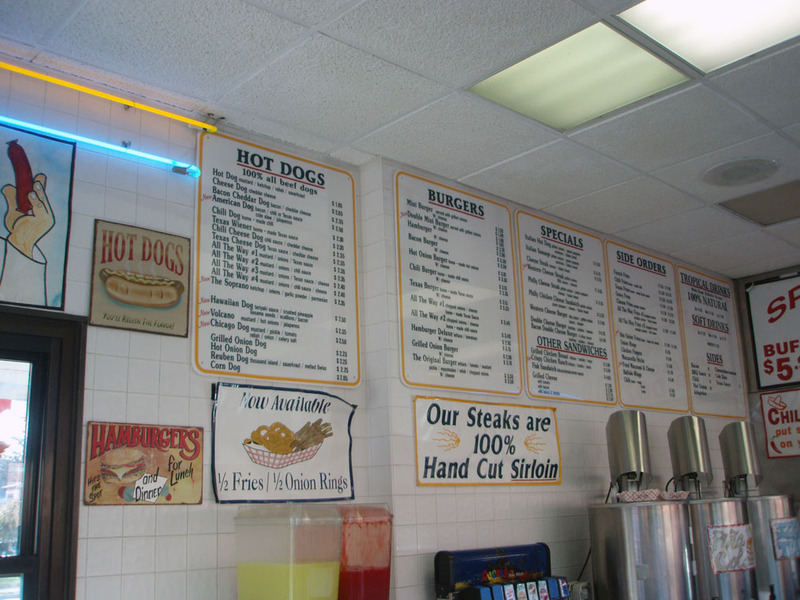 They offer a tantalizing selection of toppings, including a bacon dog, which everyone should try at least once. Here they don’t wrap the dog in bacon like at Crif, but it sits alongside the slender Sabrett’s link before being lavishly slathered with toppings. They run out of sauces and toppings at times, and we had to forgo the Hawaiian dog with pineapple, but we had the All the Way #4 and the American dog. And what’s an American dog? Overdoing it. A crisp slice of bacon, chili, creamy cole slaw and jalapenos. This is pretty close to the infamous Spicy Redneck at Crif’s in style, but falters in execution. It’s just too small and sloppy. But for $2.50 it’s at least half the price and tastes oh so good. They also have Birch beer, cream soda, black cherry soda, pina colada and fruity drinks. But the real treat is for those of us who like hot onions. My mainstay has been J.R.’s hot dog truck but now they have competition- the hot onions at the Dover Grill are a tad on the sweet side, but you can order them on your crispy, golden crinkle-cut fries! They come on the side and you can dip your fries right in. 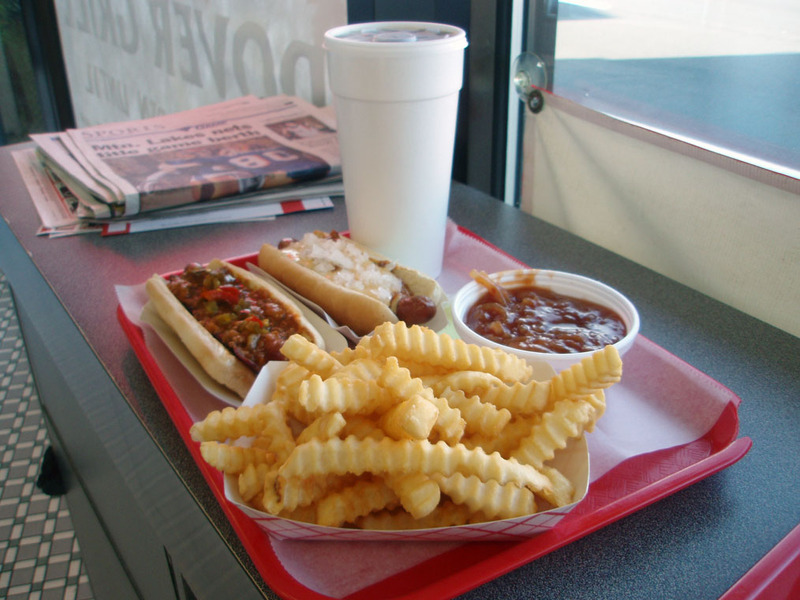 Chili & cheese are available for the purists, but hot onion fries are a tasty and original treat worth the drive for. 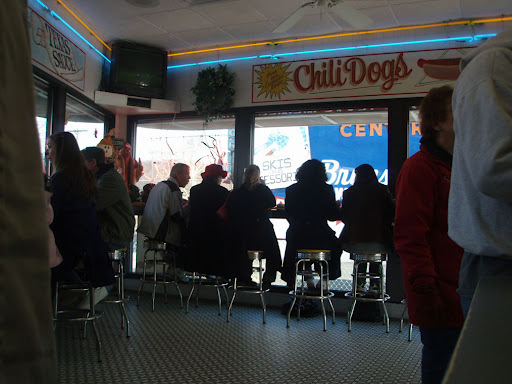 So Crif Dog may not be driven out of business by this little hot dog hut, but the next time I consider the tunnel tolls or the shuffle of public transportation necessary to get from North Jersey to the Crif, I may just hot in the car and drive over to the Dover Grill. Sure I’ll need twice as many dogs to fill me, but it will cost a bit less. The Spicy Redneck still reigns supreme, but it’s little brother- the American Dog at the Dover Grill- is worth trying when you’re not in the mood to head into the city. We’ll be back to try their other flavors too, they’ve got a bunch and they all sound great. It’s my experience that any place that serves crinkle-cut fries is one that will take good care of you. Hey Bill- I’m told Shanghai has incredible street food and soup dumplings if you’re down that way. I know there’s nothing like a greasy American burger, hotdog or pizza though. I had “Japanese Canadian pizza” in Japan once, and while tasty- it was bleu cheese and ham- it wasn’t pizza! That was also at a Canadian ex-pat’s joint, “Northern Lights” in Niigata. If I had contacts in the Chinese government I’d try to open a pizza chain there. Not sure how it would go over!